Dr. Katherine Schier is our Kalamazoo dentist with experience in both family dentistry and cosmetic dentistry. At Kalamazoo Smiles, we want your first visit to our office to be a welcome one where we can establish a lasting relationship. At your first visit, we will discuss any areas of concern you may have and what your dental goals may be. We do that in part by obtaining vital information such as your medical and dental histories. Dr. Schier and staff are committed to providing the highest quality dental care available. Improving health, comfort, function and aesthetics for our patients is always our paramount goal. Whether you’re looking to have a cosmetic dentistry treatment or just a regular checkup, your first dental visit with us will start the same way. When you arrive at our office, our Front Office Coordinator will provide you with the necessary forms to be filled out. Please provide her with a copy of your insurance card at that time. You will then meet with one of our assistants to briefly go over your dental and health history and discuss any concerns or symptoms you may have. Dr. Schier will then screen for oral cancer and gum disease and check for any tooth decay or problem areas. She will also assess how well your jaw joints and muscles are working. This exam process gives you time to get to know, and feel comfortable with, our staff and the doctor. It also gives you the opportunity to ask questions and discuss your dental needs with Dr. Schier. Before you arrive for your first dental appointment, you’re welcome to print and fill out the forms linked below. This will save time at your family dentist appointment and will allow us to better serve you. If you have any questions about the form, contact us and we’ll be happy to help you. 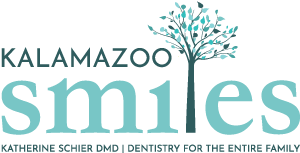 At Kalamazoo Smiles, ourKalamazoo family dentist will do everything possible to help you maximize your dental insurance benefits. We recommend that you call our office prior to your appointment to ensure that your insurance is accepted at our location. Kalamazoo Smiles accepts most major forms of insurance. We also provide multiple financing options to ensure that you receive the dental treatment you deserve at any budget. Please contact our Kalamazoo dental office before your appointment with questions about billing and financing options. Kalamazoo Smiles is happy to be your home for family dentistry in Kalamazoo, MI. Request an appointment online or give us a call at (269) 353-3700 today!